„Fair play is not just a correct sports behaviour but a lifestyle“, was heard several times during the celebration. Many current and former CFPC members and guests attended the celebration. Mr Miroslav Cerar, Vice-President of the European Fair Play Movement (EFPM), ambassador of the Republic of Slovenia for tolerance and fair play, Vice-President of the Slovenian Olympic Academy and Mrs Sonja Poljšak, member of the Slovenian Olympic Academy, were special guests. From the very beginning, they supported and assisted the CFPC activity. In a touching address speech, Miroslav Cerar reminded of the cooperation with CFPC, the importance of fair play in sport and on behalf of the Olympic Committee of Slovenia, he awarded an acknowledgement to the CFPC for successful participation in the fair play promotion. Another special guest of the celebration was Mr Darko Dujmović, one of the EFPM founders at the foundation meeting held on 27/28 May 1994 and also a creator of fair play activities within the Croatian Olympic Committee programme, even before the CFPC creation. Croatian athletes, coaches and referees; this manual is also designed for teachers, instructors, coaches, parents, athletes and sports officials in their work with children and the youth. 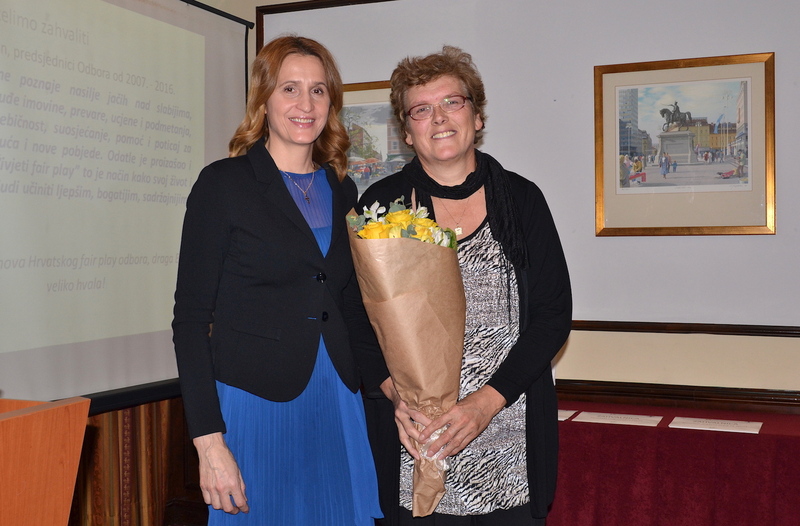 A special tribute for her activity in the last ten years was paid to Mrs Biserka Perman, the former CFPC President from 2007 to 2016. 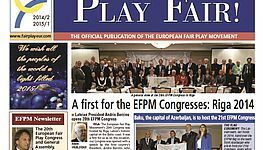 The current CFPC President, Mrs Danira Bilić, announced the fair play activities planned for the coming period: continuation of cooperation with the EFPM, cooperation with partners who participated in the activity so far, such as the Central State Office for Sport and the Agency for Education. 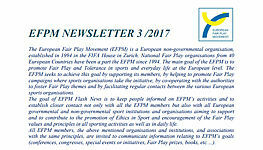 The CFPC prepared the postcards with fair play messages intended for school children, organisation of fair play week in schools, fair play minute on the Sports Television, fair play messages in the Olimp magazine … The activities with local sports communities and national sports federation have been encouraged. The Agreements on cooperation with the Croatian School Sport Federation, the Croatian academic Sports Federation and the Croatian Olympic Academy were signed during the celebration in order to promote fair play activities in the forthcoming period. 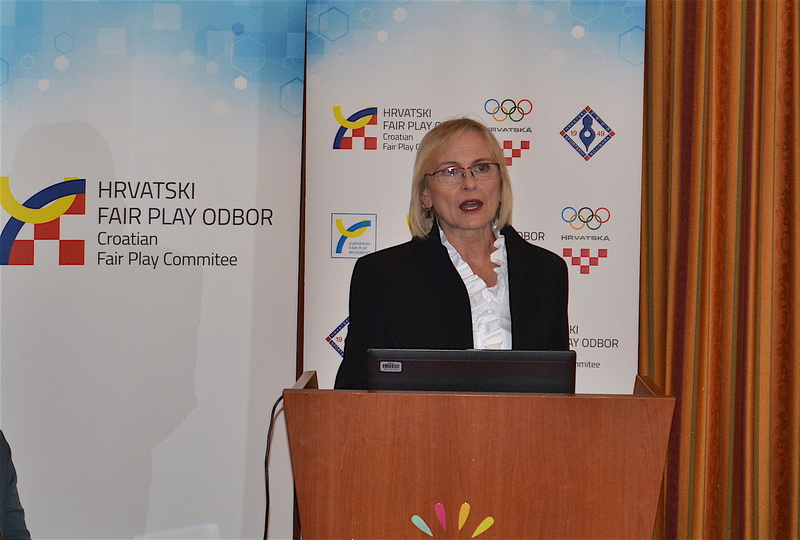 The Croatian Olympic Committee President, Mr Zlatko Mateša, commended the CFPC activity and said that it is just one segment of the fair play promotion that should become an integral part of the educational system. He also promised that the Croatian Olympic Committee will provide further support and assistance to the CFPF activity. Mr Jura Ozmec, Chairman of the Croatian Sports Journalists Association, second CFPC co-founder, said that fair play is the most beautiful thing in sport and that he is delighted that the Sports Television will soon begin broadcasting the so called fair play minute. 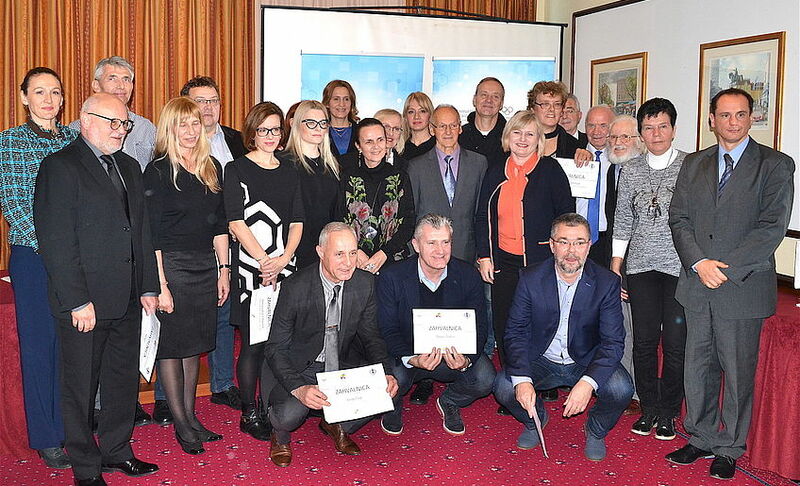 The certificates were presented to the fair play founders and all the CFPC members who deserve credit as well as to the associates from various Croatian institutions. 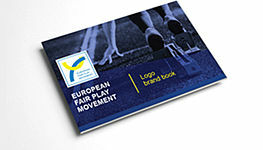 The CFPC President, Danira Bilić, promised quality improvements in the promotion of fair play in sport and outside it.